People tend to think that vegetarian food is bland, but wait, here are some recipes that will prove them otherwise. This recipe was first published in Amy Beh’s column, Cook’s Nook. Bring a pot of water to a rapid boil. 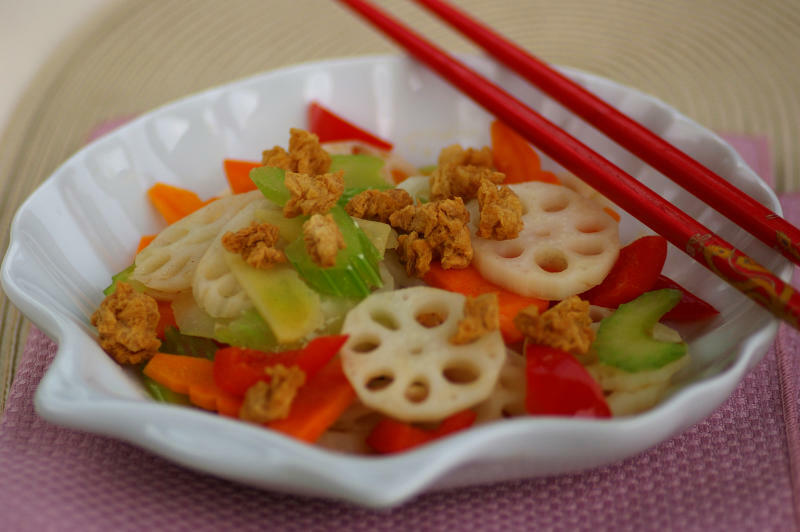 Blanch lotus roots for 1–2 minutes. Remove and steep in cold water for 10 minutes. Then, with the same boiling water, blanch the carrots for less than a minute. Drain and rinse in cold running water. Put aside. Deep-fry textured vegetarian protein puffs in medium-hot oil over low heat. Keep stirring until the puffs turn golden and crunchy. Dish out and leave aside. Heat oil and sesame oil in a wok and fry the ginger slices till fragrant. Add lotus roots and the rest of the vegetables. Stir in seasoning and toss briskly. Lastly, thicken the sauce with thickening solution. Add in the crispy crunchy vegetarian textured puffs to mix.